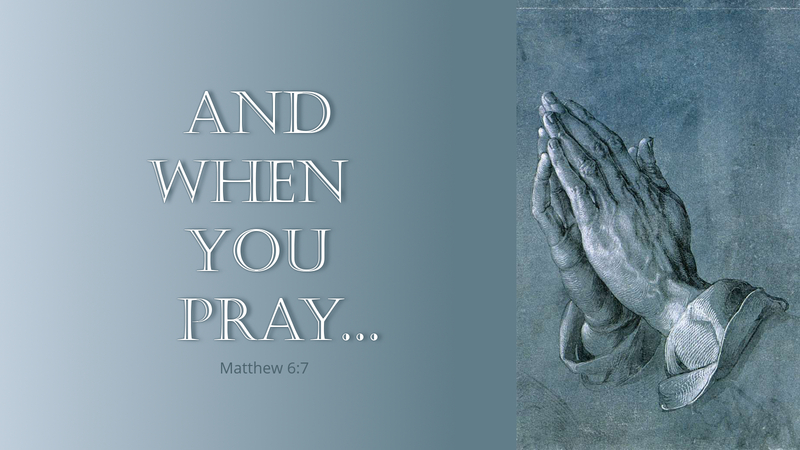 Jesus says, “And when you pray.” Roughly 60 percent of Americans claim they pray daily. Another nearly 20 percent claim to pray weekly. Those stats suggest a significant amount of praying is going on. Yet there is also evidence that what we call “prayer” doesn’t fit God’s definition or expectations. What is Christian prayer? Christian prayer is an act of worship, in which we praise and thank God for all he has done. Prayer enables us to confess our sins and ask our God to help us and others in our struggles. Christian prayer is the way we communicate with words and thoughts to our God, and is a special way for us to express our faith to God for what He has said and done for us. So then, why do we pray? Because God invites us to pray, demands it from us, and more importantly, he promises to hear us. So in thanksgiving, we come before our God in prayer. By giving us this healthy model of prayer, He is willing to teach us to pray just as He taught the first disciples. Prayer: Lord, when my words fail me, I thank you for the Lord’s Prayer that helps me pray to you and assures me that you hear my prayers. Amen.